Ekphrasis: from the Greek: a description of a work of art produced as a rhetorical exercise. I would love to say, “Sure, ekphrasis. I use that word all the time.” Except that I don’t. I have a master’s degree in creative writing and I’d never heard or read the word before. Which is a little sad considering I have been known to fall asleep with the Bedford Glossary of Critical and Literary Terms over my eyes. So it was with relief when I looked up the definition (after I’d already said yes to the reading event) and discovered I had ekphrasis-ed before. I just didn’t know it. When I was a young art major undergrad writing compare and contrast critical papers on pieces of artwork, I’d been ekphraisis-ing all over the place! 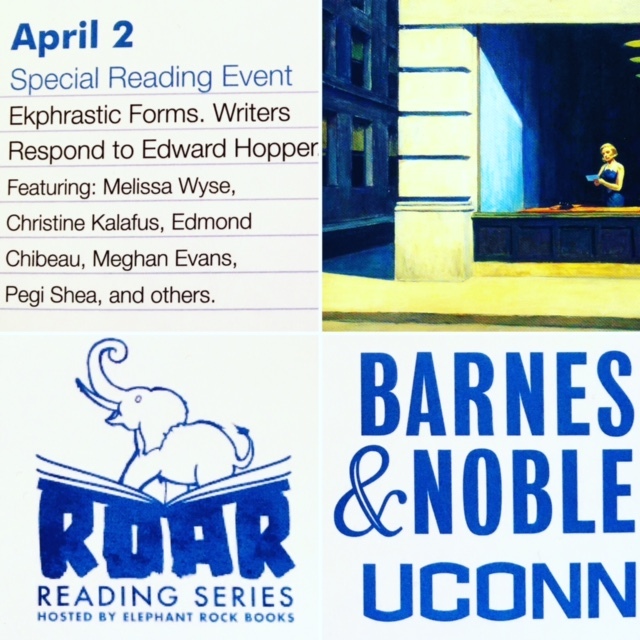 And now (too many years later to count), thanks to the wonderful invitation from Jotham Burrello, captain of the publishing ship Elephant Rock Books , director of the Yale Writing Workshop, and host of the ROAR Reading Series, I get to ekphrasis my little heart out. In public! And to a work by Edward Hopper! (I have a personal and very one-sided relationship with Hopper’s Rooms By the Sea.) Spoiler: I didn’t pick that painting. April just can’t come soon enough. If you’re looking for me before then, I’ll be in the corner with the literary dictionary.